The Hyatt Place Calgary Airport is an upscale, four-star modern hotel facility located just minutes from the Calgary International Airport. This new 2019 property features 127 spacious rooms and suites tailored specifically to your needs. Nestled next to the YYC Calgary International Airport, Calgary’s brand new Hyatt Place allows guests to exit the terminal, hop aboard the free airport shuttle and arrive at the hotel within five minutes. This new hotel features the Hyatt Place brand’s intuitive, innovative design, upscale-casual atmosphere and practical amenities, such as free Wi-Fi and 24-hour food offerings. At Hyatt Place, we understand that every trip has a purpose, and every stay should be an opportunity to recharge and make the next day more successful than the one before. After all, you never settle, so neither do we. 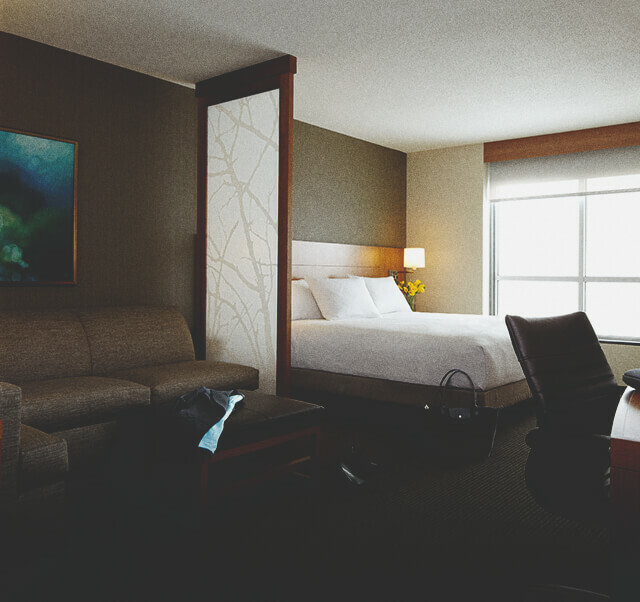 The Hyatt Place Calgary Airport is an upscale, four-star modern hotel facility located just minutes from the Calgary International Airport. This new 2019 property features 127 spacious rooms and suites tailored specifically to your needs. Features include the Hyatt Place brand’s intuitive, innovative design, upscale-casual atmosphere and practical amenities, such as free Wi-Fi and 24-hour food offerings. At Hyatt Place, we understand that every trip has a purpose, and every stay should be an opportunity to recharge and make the next day more successful than the one before. After all, you never settle, so neither do we. Nestled next to the YYC Calgary International Airport, Calgary’s brand new Hyatt Place allows guests to exit the terminal, hop aboard the free airport shuttle and arrive at the hotel within five minutes.